Our research activities so far have been focusing on flux blends with additives to validate lower water solubility of post braze flux residue. Another objective of this work was to allow for brazing of Al alloys with increased Mg levels using non corrosive fluxes. First steps have been made with selected flux blends. This paper reflects the current project status, but more work still needs to be done for further improvement. 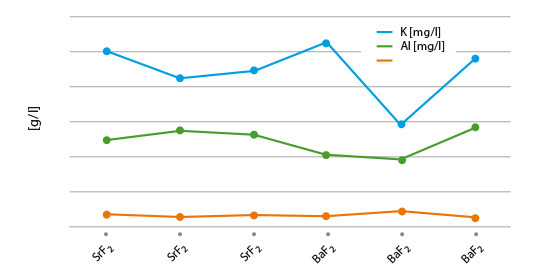 It has been shown that the flux residue water solubility is reduced by combining KAlF4 with AEFs (“KAlF4 compound concept”); among them BaF2 being the most promising candidate. Flux blends containing KAlF4 plus CsAlF4 and Li3AlF6 seem to be a promising approach to improve brazing of higher Mg containing aluminium alloys. Aluminium coupons samples (AMAG 6951 with 0.68% Mg) for the base coupon and the angle (1.36% Mg in the joint interface) require flux loads as high as 15g/m2 for successful brazing. Good joint formation can be achieved at 5g/m2 load on samples with 0.68% Mg content. Thus brazing of higher Mg level Al-alloys with appropriate flux mixtures at process-typical loads seems to be feasible. For the continuation of this project, we need to define the Mg range for real industrial aluminium heat exchanger needs. We think that this can best be done in a joint effort of HX manufacturer, Al material supplier and flux producer. Mg additions to Al alloys contribute to higher strength properties. The ongoing trend in saving weight by down-gauging of Al sheet thickness requires sufficient mechanical stability. One option for the production of higher strength Al alloys is to increase the Mg content. A disadvantage of Mg is the interaction with potas-sium fluoroamuminate fluxes during brazing, which results in poor joint formation  . 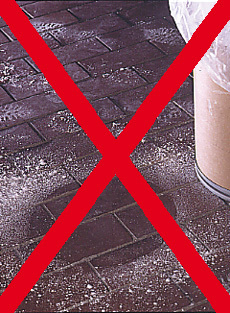 This effect, known as “flux poisoning”, is caused by the formation of high melting compounds. The addition of caesium and other metals to the flux helps to compensate to a certain degree the poisoning . For the first set of laboratory brazing experiments we chose commercially available AMAG 6951 brazing sheet (0.68% Mg, 4343 clad) and clad-less AMAG angle material (0.68% Mg) to investigate the brazing performance and joint formation. In this situation the metal-to-metal interface adds up to 1.36% Mg (2 x 0.68%) in total. Table 1 shows a list of representative flux combina-tions with NOCOLOK® types, KAlF4, Li3AlF6. CsAlF4, and AEFs. We repeated all brazing tests with each sample three times. 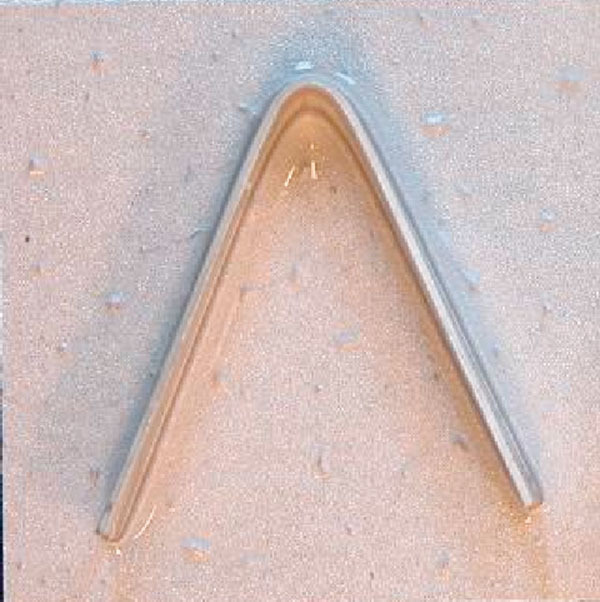 The angles from most of the AMAG specimens could be removed after brazing by pulling. Only a broken inner and outer fractured seam line was left – as can be seen below in picture 1 a. 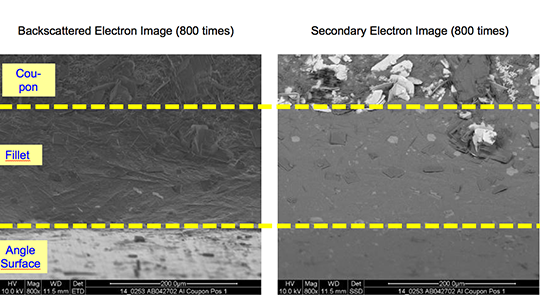 From the SEM analysis it is evident that a proper met-allurgical joint between base and angle has not been formed. There is flux residue present in the pulled apart fillet. This indicates that the liquid filler alloy was not capa-ble of pushing out completely the flux of the joint and it could be an explanation for the weakness of the fillet. However, in case of the blend MD001212 LiCs24 with load 15g/m2 the joint structure is thorough as can be seen in picture 3 a). It is worth mentioning when connecting blocks are brazed to condenser manifolds often a high load of manually applied flux is used in order to overcome the high Mg content in the block material. For such a case using the mixture MD001212 would allow for having quite high Mg content in the block material, which can be required by the designers of condens-ers. The structure of the joint cross section below (picture 4) obtained with flux MD001212 LiCs24 shows good quality. The water solubility of standard NOCOLOK® Flux is 4.5 g/l, whereas for post-braze flux residue (pbr) it is 2.7 g/l. 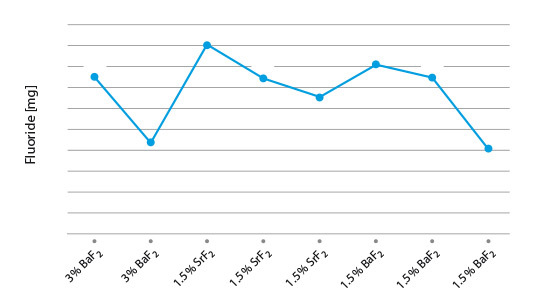 Post-braze residue of NOCOLOK® Li Flux shows a solubility of 2.2 g/l . In the periodic table of chemical elements the group I fluorides have a reasonable low solubility (LiF: 2.7g/l [20°C]), but their Al-F-complexes much lower (Li3AlF6: 1.1g/l , K2LiAlF6: 0.3g/l with about 183 mg F-/l, K3AlF6: 2g/l), the group II fluorides (Alkaline Earth Fluorides “AEF”) show very low solubility (MgF2: 0.13g/l, CaF2: 0.016g/l, SrF2: 0.12g/l [25°C], BaF2: 0.12g/l [25°C]) . Based on the facts of the dissolution behaviour of NOCOLOK® Li and the much lower solubility of the AEFs, we started investigating combinations of potas-sium fluoroaluminate fluxes with selected AEFs to combine the brazing characteristics of NOCOLOK® type flux with the very low solubility of AEF. NOCOLOK® Flux consists of potassium fluoroalumi-nates with a specific ratio of KAlF4 and K2AlF5. Each of these compounds has different solubility. The combination of the (pure) compounds with different AEFs was of our main interest. 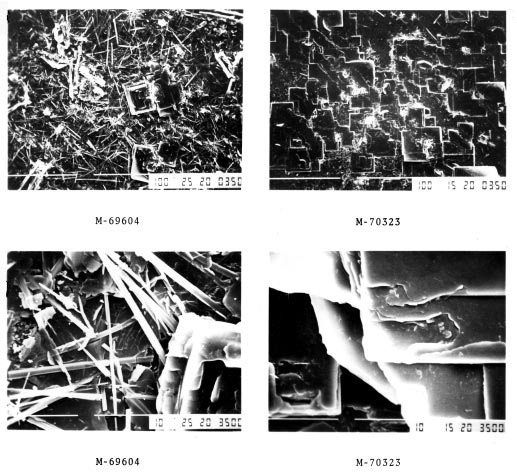 We melted and pulverized the flux blends, dissolved them in a defined amount of DI-water and analyzed for K, Al and F.
The results from coupon brazing under laboratory conditions and the solubility of the flux residue can be seen in figure 2. Among the combination of NOCOLOK® type fluxes with diverse AEF additions, KAlF4/BaF2 shows the lowest residue F– solubility, i.e. 4mg/l. All our laboratory brazing tests with the samples showed the same good results like with standard NOCOLOK® Flux. Corrosion comparison tests will be subject for future investigations. For more than 30 years, potassium fluoroaluminates (NOCOLOK®) fluxes are already successfully used in controlled atmosphere brazing (CAB) of aluminium heat exchangers. Residues of these so-called non-corrosive fluxes have very low – but evident – solubility in water  . In the discussion about corrosion of CAB produced aluminium heat exchangers, the flux residue solubility is an important parameter. 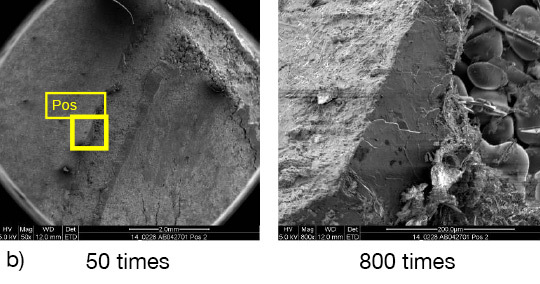 There are concerns that – in addition to several other factors – fluoride ions (F–) potentially released from dissolved residue play a role in aluminium corrosion. A theoretical option to address this point is the development of virtually insoluble flux. More realistic, however, will be fluxes with less soluble residues than the current compositions. Some commercialised NOCOLOK® derivates, like NOCOLOK® Li Flux show already reduced solubility when compared to the standard product . While investigating the chemical possibilities for further minimising the residue solubility and the release of F- ions, we have developed NOCOLOK® variants in combination with selected inorganic fluorides. During this R&D project we also looked closely at the brazing properties of the new fluxes – with a focus on their performance for brazing of aluminium alloys with higher magnesium level. The current maximum magnesium range suitable for CAB with standard NOCOLOK® Flux is approximately 0.3%. Some improvement can be seen when using caesium-containing NOCOLOK® formulations (up to 0.5% Mg)  . Some of the new fluxes we developed for further reduced residue solubility surprisingly show higher magnesium tolerance. 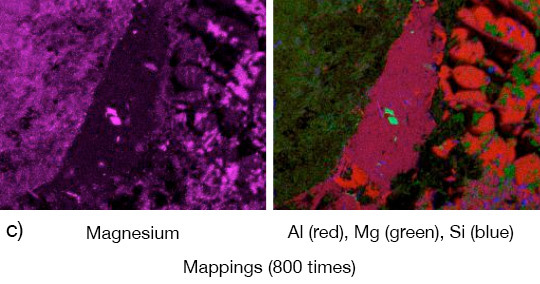 This article summarizes the results of our laboratory work related to the development of fluxes with further reduced residue fluorides solubility and improved magnesium tolerance. For experimental lab furnace brazing we used standard CAB brazing profile and 25 by 25 mm clad sheet coupons (single side) with angle on top. In case of the Mg topic an AMAG (Austria Metal AG) clad alloy (6951/4343) was brazed with an AMAG clad-less angle. Fluxing was done manually (flux load weight on precision scale, drops of isopropanol and homogenous spreading). Coupon (3003/4343) with Al angle (Al 99.5%) were manually coated with a dedicated amount of flux blend and brazed as described in point 1. 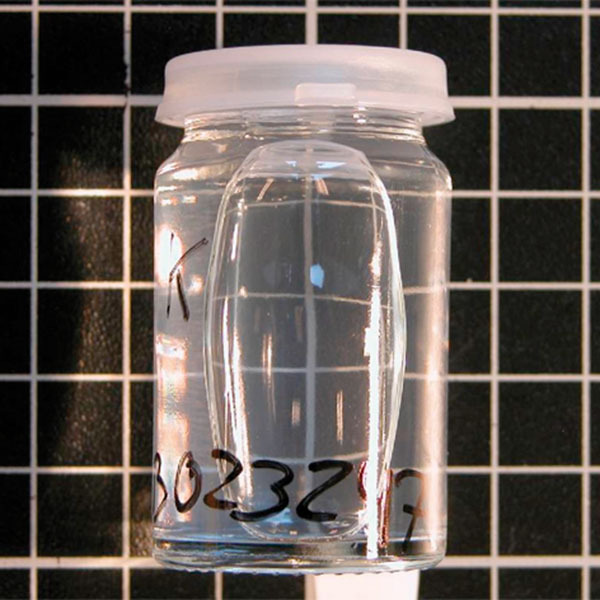 Brazed samples were placed in PET bottles and a defined quantity of demineralised water was added. Daily visual control and air exposure (by opening and closing the lid) was done.